Apple Store Philippines Now Offering iPad Air and iPad Mini with Retina Display! iPad 2 and First Generation iPad Mini, Still Out! Exactly one month and 17 days after Apple's new generation tablets became available in the company's key markets including the US and UK, today, iPad Air and iPad Mini saw official release in the country via Apple Store Philippines online. Apple iPad Air - which sports a thinner and lighter redesigned shell, 9.7-inch 2048 x 1536 pixels IPS display panel, 64-bit desktop-class Apple A7 chipset with M7 motion co-processor, 5 MegaPixel main camera, 1.2 MegaPixel front cam, and Full HD video recorder - starts at Php 25,490 for the 16GB WiFi only variant and goes for as high as Php 46,990 for the 128GB WiFi plus Cellular model. Apple iPad Mini with Retina Display, on the other hand, looks almost exactly like its predecessor except that it now has a higher-resolution 7.9 inch IPS display (hence the name) and more powerful innards similar to that of the larger iPad Air. Users of this device will also enjoy the benefits of the 64-bit desktop-class Apple A7 chip with M7 co-processor, 5 MegaPixel main camera, 1.2 MegaPixel front cam, and Full HD video recorder but on a slate with a far smaller footprint. 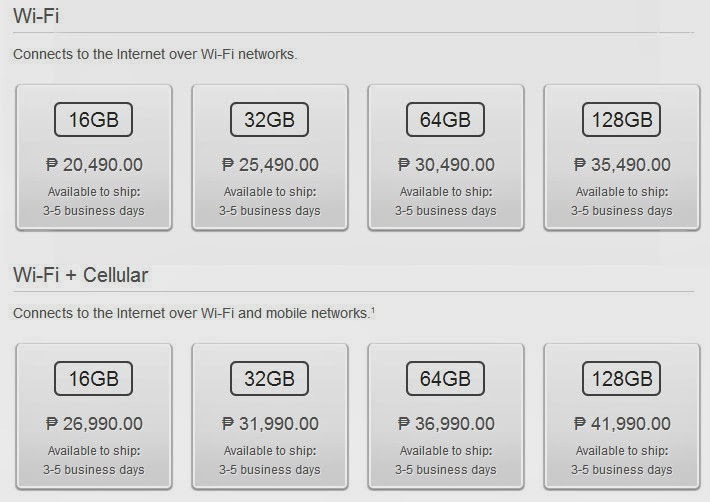 At the Apple Store, the iPad Mini with Retina Display starts at Php 20,490 for the 16GB WiFi Only version and sells for as high as Php 41,990 for the 128GB WiFi + Cellular variant. Along with the formal launch of the iPad Air and iPad Mini with Retina Display in the Philippines, Apple has discontinued selling the iPad 4 from last year and The New iPad, which it superseded. Interestingly, though, the Cupertino company has begun reselling 16GB WiFi Only and 16GB WiFi plus Cellular models of the non-Retina, Apple A5 powered iPad2, originally released in 2011! The non-Retina First generation iPad Mini is still in Apple Store's active line-up of slates albeit there are now only two models available. 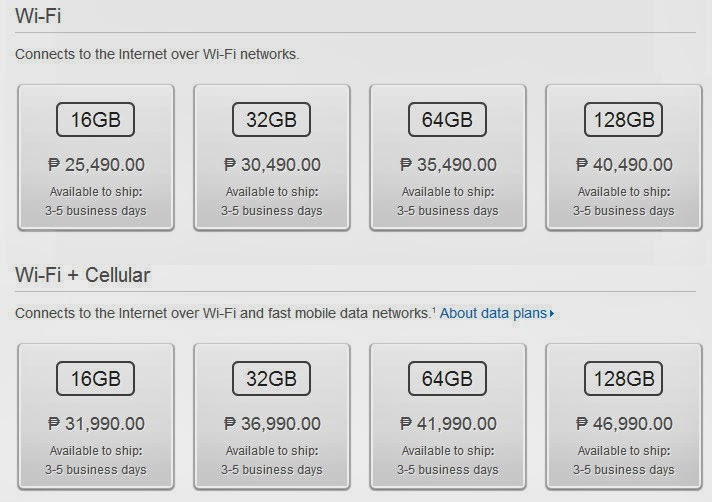 You can get the 16GB WiFi only variant for just Php 15,490 while the 16GB WiFi + Cellular models goes for only Php 21,990. All of these tablets have been featured extensively on TechPinas. For more information about these products, kindly use the TP Search Bar above. Oh, and just a tip, Kimstore - my trusted online store - is currently selling all iPad Air and iPad Mini with Retina Display variants at around Php 3,000 less than their prices on Apple Store Philippines. Also, you may now get both of these slates as bundled devices with Smart's affordable LTE postpaid plans.